One hundred years ago, on Sunday October 27th in 1917, the ceremony of unveiling the memorial fountain, at the West Cemetery, took place. A good many people, including Amble and Alnwick councillors, gathered around the beautiful piece of work, a fitting memorial to William Gibson, who designed the West Cemetery. It was a fine setting for the event, amid the scenery of the cemetery, with the autumnal colours of the trees. The East Cemetery, Broomhill Cemetery and Amble’s great water scheme were also designed by William Gibson. He had died suddenly on September 23rd, 1913. 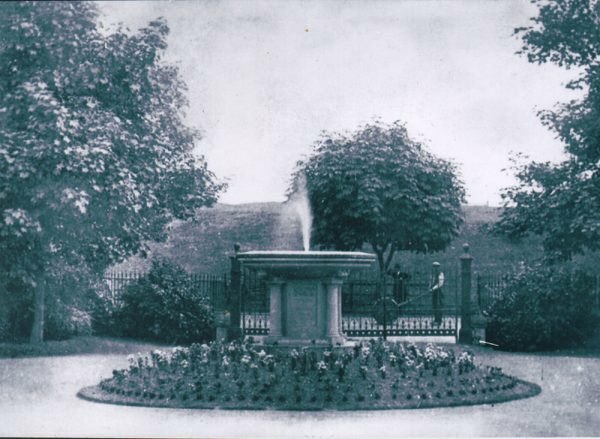 Because of the start of the First world War, it was decided by the council committee to delay the erection of the fountain. Funding for the memorial started after the war had ended. The cost was £71 but they were £10.45 short of that amount. However it was made up by donations from the public, who put their contributions in a box, placed on the gates. Mr. Burton, surveyor, designed the fountain. It is of Howorth stone and weighs over a ton: the first public monument erected in Amble. The architecture is Doric. On the west side panel are the Latin words: ‘Monumentum quiris circumspice’, which translates ‘If searching for his monument, look around’. I believe the memorial fountain was shut down during the Second World War. Then in 2000 it was overhauled and restored, with funding from the Co-operative Society, applied for by Kit Rollo. It was switched on again in July of that year. Since then further restoration has been carried out so that it continues to flow.